The Brave One starring Jodie Foster is a tale of revenge in it's rawest sense and the therapeutic values that can be found within revenge. Obviously, the film serves as a throwback to the "Deathwish" series starring Charles Bronson. Such themes, tickle a dark corner within our psyche, a corner so dark that most of us deny the sense of satisfaction we receive when we witness the protagonist exact retribution upon those who so aptly earned said retribution. Could you imagine a world with vigilante justice? Or is it as in the title of the movie, that only the brave ones are willing to cross such a line, to enter a realm that remains truer to ones ancestral/tribal cores, than what we have these days; a digitized/plastic culture that is easily redeemed with a credit score and high powered lawyers? 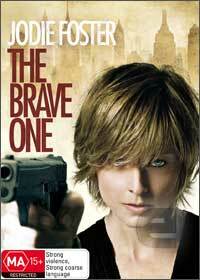 If anything, as in the old "Deathwish" films, "The Brave One" is thought provoking.